by Larry Allen McCluney, Jr. (Arcadia Pub & The Hist Pr, 2017). Ed Bearss and Warren Grabau have given us a pair of tome-sized Vicksburg Campaign histories, and Michael Ballard has authored a concise and well received campaign overview, but the set of book-length standalone battle and sub-operations studies remains limited. 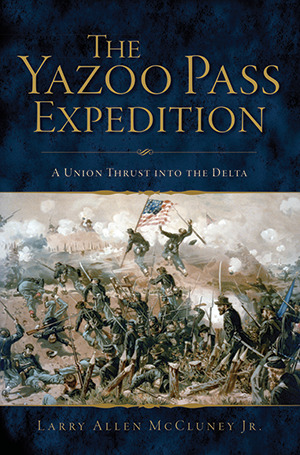 Larry Allen McCluney's The Yazoo Pass Expedition: A Union Thrust into the Delta belongs in that last category and is, I believe, the first of its kind. From the description: "After six failed attempts to reach Vicksburg, General Ulysses S. Grant developed a plan. The Yazoo Pass Expedition was a Union army/navy operation meant to bypass Vicksburg by using the backwaters of the Mississippi Delta. Operations began on February 3, 1863, with a levee breach on the Mississippi River. The expedition was delayed as a result of natural obstacles and Confederate resistance, which allowed the Confederate army under Lieutenant General John Pemberton to block passage of the Federal fleet. The Confederates continued to rebuff the fleet and finally defeated it in the spring." Review of Scythes, ed. - "THIS WILL MAKE A MAN OF ME: The Life and Letters of a Teenage Officer in the Civil War"
Benjamin Gould's Investigations in the Military and Anthropological Statistics of American Soldiers (1869) found that only five of the 37,183 Union Army officers in its study sample were seventeen years of age. This makes 17-year-old Lieutenant Thomas James Howell of the 3rd New Jersey Volunteer Infantry Regiment a rarity, indeed. 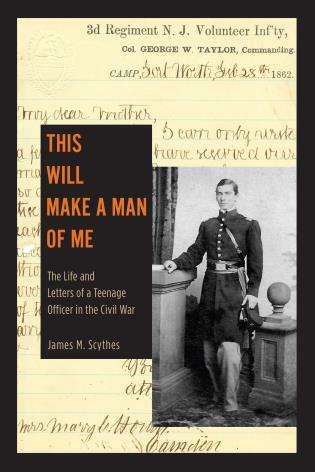 His series of wartime letters home are the chief attraction of James Scythes's This Will Make a Man of Me, which also provides an informative biographical treatment of its youthful subject. Sixty-five of Howell's letters survive, either in original form (31) or as transcriptions (34), and the book organizes them into two parts. Part I begins with civilian Howell's trip to the Virginia front in January 1862 in order to secure a freshly vacated second lieutenant post in the 3rd New Jersey and ends with the unit's embarkation to the Virginia Peninsula. Part II spans April 15-June 26, 1862, when Howell and the 3rd joined the Army of the Potomac for the drive on Richmond. Unfortunately for the army and for Howell himself, things did not go according to plan. On June 27, Howell was killed during the closing moments of the Battle of Gaines's Mill, and by the end of the Seven Days the Confederate army had earned a hard won campaign victory. The 3rd NJ (Kearny's Brigade, Franklin's Division) did not directly participate in the main fighting for any of the major Peninsula battles prior to Gaines's Mill, so Howell's letters are not filled with detailed accounts from the firing line. For what he did see, however, Howell was a regular and highly observant correspondent. During his first months of duty, he penned detailed descriptions of the outpost war in northern Virginia. After arriving on the Peninsula, he wrote long letters to his family chronicling what he witnessed from his reserve position at the Battle of Eltham's Landing and from his rear post behind the far right flank of the Union line south of the Chickahominy River during the early stages of the Seven Days. Howell's lengthy letters home are rich in details about camp life and company officer's duties. He wrote frequently about drilling, dress parades, and target practice, while also relating to his family, among other things, what it was like to be officer of the guard and officer of the day. The tone and content of the letters really show Howell to be mature beyond his years. Forced to learn on the run, he seems to have adjusted to his weighty responsibilities quickly and well. All the more impressive is the fact that his company's captain and ranking lieutenant were absent most of the time, leaving junior officer Howell in charge of the company. As Scythes notes, it's unfortunate for us that no diaries or letters written by the privates and non-coms that served under Howell survive, as they might have provided insights into how the older men viewed their uncommonly youthful lieutenant. Howell himself relates that he felt he was well liked by his men and his letters note no significant problems with insubordination. Perhaps he was aided by his greater than average size (he was six feet tall). Of course, rare was the Civil War regiment with no petty jealousies and hatreds shared among the officers, and Howell frequently clashed with the 3rd NJ's Lieutenant Colonel Brown (who apparently drank heavily). Even Howell's best officer friend in the company ended up colluding against him with Brown, a disheartening situation that undoubtedly contributed mightily to Howell's generally negative opinion of his fellow volunteer officers. For obvious reasons, Howell's letters home abruptly end on June 26. Using a number of sources, including eyewitness accounts of Howell's actions during the Battle of Gaines's Mill and of his death later that day, Scythes is able to admirably reconstruct in his book's concluding chapter the final moments of the teenage lieutenant's life. By all accounts, Howell coolly kept his company well in hand during the intense fighting around Boatswain's Creek and was able to quickly reform the men during the Union retreat to the Chickahominy bridges. It was at this time during the late afternoon that Howell was struck and killed by a stray round shot. Scythes's editing contributes significantly to the value of the book. In researching his extensive biographical and contextual narratives, he consulted a broad range of sources (including manuscript collections, government documents and reports, books, periodicals, and newspapers). Endnotes are plentiful and, in addition to standard source identification, provide useful information on persons, places, and events mentioned in the letters. Given that Howell's battlefield experiences were primarily behind the lines, and he was killed during his first major clash of arms (thus depriving us of any personal record of those moments), it would be difficult to argue that the volume ranks high among the collection of firsthand military accounts of the Peninsula Campaign. Nevertheless, as mentioned above, there are other points of interest that make the volume worthwhile. The letters, which are numerous, highly descriptive, and remarkably complete, offer readers a singular record of a teenage company officer's experiences and perceptions of the early stages of one the war's greatest campaigns. Through the fine efforts of historian James Scythes, This Will Make a Man of Me treats a tragically brief life story with the gravity and historical appreciation that its uniqueness deserves. by John R. Kelso, edited by Christopher Grasso (Yale UP, 2017). This new book has some thematic similarities with Monday's Booknotes title. 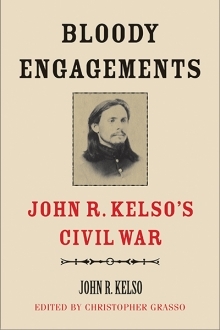 Missouri's John Russell Kelso experienced both regular and irregular aspects of Civil War service, first as a Missouri volunteer infantry private then later as a scout and cavalry officer fighting guerrillas and various Ozark outlaws. In Bloody Engagements, Christopher Grasso edits the wartime sections of Kelso's unpublished autobiography, as well as two post-war political speeches. From the introduction, we learn that the original manuscript was lost after Kelso's death in 1891, and what survives is a copy of the autobiographical account up to 1863 (presumably, this is the document that resides in the Huntington Library). So the book covers secession, the beginning of the war in Missouri, the fighting at Wilson's Creek, Pea Ridge, Forsyth, and Springfield, and many other incidents and events from the war. Grasso contributes a lengthy introduction to the volume, explanatory footnotes, a timeline of Kelso's life, an index, and also arranged for a trio of nice maps. If you have an interest in the Civil War in the Ozarks, this looks like a good one to add to the home library. edited by Brian D. McKnight & Barton A. Myers (LSU Press, 2017). From the spring catalog offerings, this was one of the titles I underlined early on as a must-read. The guerrilla literature has been expanding rapidly in many different directions but much of the focus still remains on the fighters themselves. 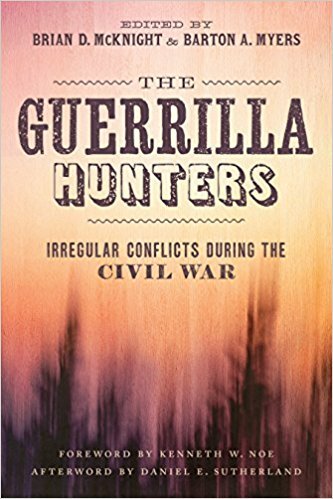 The initial assumption I had about The Guerrilla Hunters was that it would focus on the other side of the equation, the leaders, men, and units that conducted counter-guerrilla operations. Now that I've seen the actual book, the topics involved appear to be a bit more expansive than that kind of limited categorization. With sixteen chapters plus a foreword and afterword, the volume greatly exceeds the number of contributions (around ten or so) found in the typical Civil War essay anthology. Also included at the end is a dozen-page 'reader's bibliography' of the guerrilla war literature which should prove useful. Yesterday, Dimitri Rotov was wondering about books on the 1856 election, if any good ones exist. 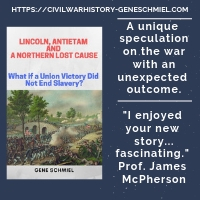 I haven't looked into what's already out there, but John Bicknell's soon to be released Lincoln's Pathfinder: John C. Fremont and the Violent Election of 1856 (June '17, Chicago Review Pr) has been on my radar for a while, and I suspect that DR has seen it, too. I agree with Dimitri that 1856 holds points of interest more numerous than just a presidential election that established a blueprint for sectional party success four years later. For those seeking connections between 1856 and 1860, the fluffy, meandering book description of Lincoln's Pathfinder isn't much of an appetite builder, but you can never really trust those things anyway. The author does seem to enjoy framing elections as great national landscape-altering events [see also America 1844: Religious Fervor, Westward Expansion, and the Presidential Election That Transformed the Nation (2014)]. Review of Doyle, ed. - "AMERICAN CIVIL WARS: The United States, Latin America, Europe, and the Crisis of the 1860s"
At least for most North Americans, the epic struggle between the Union and the Confederacy has tended to shoulder aside popular knowledge of other much smaller, but still significant, Atlantic world conflicts that occurred during the decade of the 1860s. Many readers are familiar with French intervention and the civil war in Mexico, but there were other sources of strife in Latin America that drew the the world's attention at the time. 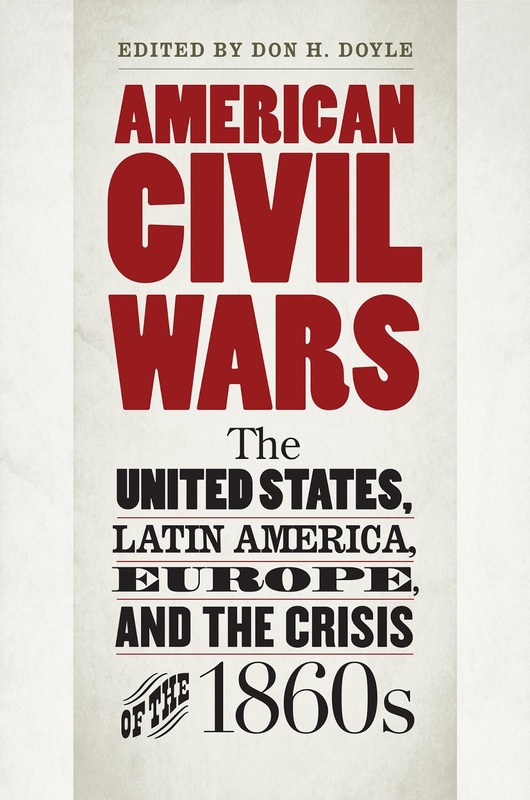 Many of these events are described and analyzed at length in the new essay anthology American Civil Wars: The United States, Latin America, Europe, and the Crisis of the 1860s edited by Don Doyle. In this volume, Doyle has assembled an impressive cast of international scholars. In several cases, expert command of important source material in their native countries allows contributors to offer a number of insights that may have escaped many U.S. historians of the Civil War era. Jay Sexton begins the proceedings. Like most modern scholars, he includes the United States in the list of great imperialist powers of the nineteenth century, though he perhaps appreciates better than some the non-linear, fits and starts nature of the progression and the robust level of domestic debate involved. One of the main points of his essay revolves around the Civil War's settlement of internal sectional division as prerequisite to sustained national expansion near and far (a situation greatly different from ancient Rome, for example). In the following essay, Howard Jones, who has written extensively about Civil War diplomacy, effectively reminds readers that foreign recognition and possible intervention were always self-interested questions for the European empires, with moral qualms over slavery never figuring most prominently in their calculations. His chapter provides a very useful summary of the issues and concerns raised by the British, French, and Spanish governments in relation to how best to deal with, and perhaps take advantage of, the American Civil War. Multiple volume contributors (Jones among them) tend to agree with the traditional view that the possibility of European intervention peaked during the late summer and fall of 1862. Patrick Kelly's examination of southern aspirations in Latin America persuasively argues that secession instantly (and more than bit ironically) neutered dreams of a greater slaveholding empire. Once secession unlinked the South from the vastly more powerful economic, military, and diplomatic backing of the United States, the Confederacy lacked the resources and navy necessary to seize and hold faraway lands. In the writer's view, Mexico and Spanish Cuba, both long desired targets of southern politicians, quickly realized how little they had to fear from a Confederacy fighting for its own life in North America. Far from being able to negotiate foreign concessions from a position of strength, Confederate leaders had to humble themselves before all and repeatedly assure even the weaker powers of Mexico and Spain that their country no longer had designs on previously coveted territories. While self-interested northern Mexico state governors like Santiago Vidaurri cooperated with Confederate officials, the Mexican central government confidently and repeatedly rebuffed Confederate alliance overtures. Continuing on this line of reasoning, ready Confederate acceptance of French intervention while getting nothing in return from Napoleon's government beyond baseless hopes of future recognition comprised further evidence of Confederate weakness in power projection. Richard Huzzy marks the decade of the 1860s as a crisis of the British Empire in the Americas to coincide with the internal difficulties of the United States. In deciding how best to protect and further their own interests, Britons struggled over whether to cooperate with U.S. ambitions (citing common racial and cultural heritages) or adopt the riskier and more expensive confrontational stance of containment and competition. Imperial crises cited in the article include European intervention in Mexico, a bloody uprising in Jamaica, and concerns over how much imperial capital should be invested in furthering Canadian development as a counterbalancing force to growing U.S. capabilities (ex. building a transcontinental railroad to compete with the continental and Pacific aspirations of the U.S.). As Huzzy demonstrates, by the end of the decade it was clear to all involved that the U.S. was boundlessly ascendant and British dominion in the Americas was on permanent wane. The American Civil War also put Napoleon III's "Grand Plan" of containing the growth of the United States into full motion. Citing official diplomatic documents in French archives, Steven Sainlaude contends that French intervention in Mexico was much less about collecting outstanding debts (France had the smallest claims among the three European powers that intervened) and more about blocking U.S. ambitions in the rest of the Americas. France didn't want any single power to dominate any of the world's continents, and its government sought to create a centrally located Latin alliance in the Americas as a regional counterweight to the Anglophone powers. While Kelly's previous chapter created the picture of a Confederacy unable to realize antebellum territorial ambitions, Sainlaude's position is that the professionals in the French diplomatic corps (unlike their emperor) were more concerned by the threat to Mexico of an independent Confederacy (with its filibustering tradition out of temporary retirement) than they were in weakening the United States. These career diplomats did everything in their power to block Napoleonic favor toward a Confederate government that was clearly not out to completely abandon the Monroe Doctrine and was only forced into currying favor with the French after badly botching initial overtures to Juarez. In the end, the French weren't prepared to do anything unilaterally when it came to intervening in the American Civil War. By the middle of the decade, the U.S. emerged even more powerful than before, and a complete French military withdrawal conceded the end of the Grand Plan. Like France, the Spanish Empire also moved to take advantage of the internal troubles of the U.S. to both strengthen and expand its own holdings. Cuba, coveted for decades by a powerful southern proslavery political bloc, was Spain's imperial jewel and distrust of future Confederate aims toward it prompted Spain to keep the breakaway republic at arm's length. Christopher Schmidt-Nowara's article also cites the Spanish reannexation of the Dominican territory as an opportunistic move. But, like France in Mexico, Spain miscalculated and fighting Dominican insurgents proved an expensive drain on the imperial treasury. According to Schmidt-Nowara, Union victory in the Civil War also ignited latent abolitionist elements in Spain, which, in combination with a decade-long civil war in Cuba beginning in 1868, caused Spain to reconsider its colonial priorities and shift to a more Pacific focus (i.e. the Philippines). Anne Eller's companion piece goes into much more depth on eighteenth century Dominican history under a series of foreign and domestic rulers, concentrating on the disastrous failure of Spain's 1861-65 experiment in recolonization. Compounding Spanish discomfiture, the successful popular insurgency on the island inspired similar uprisings in Puerto Rico and Cuba. As both essays convincingly demonstrate, nothing went the Spanish Empire's way in the Caribbean during the 1860s. Ever since it achieved independence from Spain in 1821, Mexico sought in vain political stability and economic prosperity for its population, as well as a workable relationship between the state and the rich and powerful Catholic Church. Erika Pani's essay usefully summarizes the political history of Mexico during the 1850s and 1860s, as the nation experimented without any great success with republicanism, dictatorships, and monarchism. American Civil Wars also shows that the 1860s period was a decade of crisis for the smaller independent countries of Latin America. Hilda Sabato's chapter interestingly examines the evolution of the political and military institutions of Spanish America during the first half of the nineteenth century. Findings include the early prevalence of decentralized republican forms of government there (following various models), with armed citizenries willing and capable of applying force to politics. Distrustful of peacetime militaries from their colonial experiences, these citizen militias were the primary defense force in Latin America during this time. Professional armies gradually developed, but their relationships with the militias were deeply troubled. These civic and military combinations tended toward instability, and revolutions were frequent events. According to Sabata's analysis, the 1860s were something of a watershed period before centralized governments with dominant standing armies for defense and internal coercion became the norm in Latin America later in the century. It could be said that the existence of slavery in the United States (the world's foremost beacon of freedom) shielded the institution from international pressure in other places in the Americas like Cuba and Brazil, and Matt Childs argues that three great events in the 1860s placed Cuban slavery on the road to extinction (though it would persist until 1886). The enduring Caribbean slave trade did much to sustain the system, and several American Civil Wars authors mark the Lyons-Seward Treaty of 1862 as a seminal moment in putting real teeth into choking off the illicit trade. Also, the end of the Civil War sparked the abolition movement in Spain itself, which ended the slave trade participation on their end only two years later in 1867. Finally, Childs makes the excellent point that wars involving slave societies very often led to emancipation (planned or not), and that also proved to be the case in Cuba, where large numbers of slaves joined the rebels during the long civil war that began in 1868. After this great decade of crisis and change was over, slavery in Cuba was in irrevocable decline. As it did with Cuba, the American Civil War also heavily influenced the end of slavery in the system's last bastion in the Americas, the Empire of Brazil. World opinion mattered, and Brazil was understandably unwilling to shoulder the collective scorn attached to being the only remaining slave power in the Atlantic world. Aided by the fact that slavery was not a sectional or party issue like it was in the U.S., Brazil was able to implement gradual emancipation in the form of a free-womb law. As essay author Rafael Marquese shows, worries over the economic consequences of abolition in Brazil were greatly alleviated by the relatively rapid recovery of the U.S. cotton industry, as well as certain structural economic changes in the decades following the 1860s. Twentieth-century Brazilian slavery was a distinct possibility without the great events of the 1860s, and Marquese's chapter successfully argues that Brazilian slavery could not have ended when it did (1888) or how it did without the American Civil War. The volume contributors do lightly engage with each other in direct form in their essays, mostly in the form of positive reinforcement, and, in terms of collective themes, a few points are worthy of note. There is much consensus among the contributors about the high degree of fear felt by all involved (Great Britain, France, Spain, and Mexico) when it came to the real and latent power of the United States. While supported by the evidence, it does also seem likely that this interpretation is to at least some degree tinged by backward argument from current reality. An interesting additional essay might have charted how much world power views of the U.S. were altered by the scale and rapidity of the North's industrial expansion and military mobilization. Along this line, Schmidt-Nowara relates an illustrative tale of how deeply impressed a high Spanish official was by the size, material resources, and outward appearances of military professionalism displayed by the Army of the Potomac in early 1862. Another common thread is just how much Great Power distrust of Confederate motives outweighed the superficially more pragmatic move of supporting Confederate independence as a way of weakening and containing the United States. The most popular view at the time seems to have been that the southern section was the driving force for expansion in the antebellum United States, and there was more to fear from that than a reunited republic, but this seems to somewhat contradict Patrick Kelly's persuasive interpretation of secession as self-defeating when it came to Confederate empire building. Then again, with so many known and unknown variables involved, no foreign policy is ever truly consistent. Regardless, the Confederacy's death in 1865 rendered many of these questions moot. This is an utterly fascinating set of essays, a fine collection of cutting edge international scholarship examining the political and societal reverberations of the American Civil War as its shockwaves spread both eastward across the Atlantic and southward into the Caribbean islands and Central and South America. In addition to being highly recommended reading for any student of the North-South conflict, the volume would make an excellent addition to any course curriculum addressing the geopolitical dimensions of the Civil War. 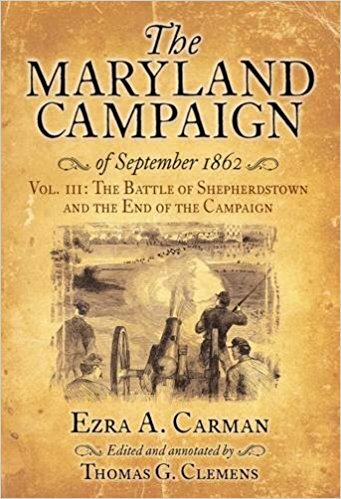 • The Maryland Campaign of September 1862 - Volume III: Shepherdstown Ford and the End of the Campaign by Ezra Carman, edited and annotated by Thomas G. Clemens (Savas Beatie, 2017). This third volume of The Maryland Campaign of September 1862 marks the end of Tom Clemens's journey to bring a definitive edited version of the massive Carman manuscript to print. The book's introduction provides a good rundown of the content within. The first chapter covers the Battle of Shepherdstown, the campaign's final battle. A casualty and results analysis is next, followed by a discussion of high level strategy and political conflicts that occurred during the campaign's aftermath. The original intent of the final two chapters is speculative. The second to last chapter covers events preceding the Maryland Campaign (including the Second Bull Run command fiasco), and the last is a general summary of the campaign up until the Antietam battle. The appendix section has three parts. The first two appendices are composed of errata for the preceding volumes, and the third is an extensive 'biographical dictionary' (138 pages in length) of individuals (civilian and military, both famous and obscure) "mentioned in Carman's manuscript or mentioned by [Clemens] as providing information to Carman." The book also has four original maps. 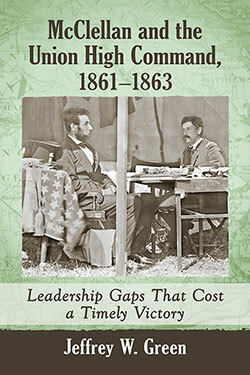 Author Q & A: Jeffrey Green on "McClellan and the Union High Command, 1861-1863"
Today, we are joined from Down Under by Jeffrey Green to discuss his recently released book McClellan and the Union High Command, 1861-1863: Leadership Gaps That Cost a Timely Victory (McFarland, 2017). Green is Conjoint Lecturer in History at the University of Newcastle in New South Wales, and he's been kind enough to answer a few questions about his new book. DW: There is a small body of literature discussing Australian and New Zealand connections to the American Civil War. Terry Smyth’s Australian Confederates (2015) is the most recent book that comes to mind. Does the American Civil War excite much interest among fellow military and social historians in your country? JWG: I don’t think a lot of people in the U.S.A. understand the high level of interest many Australians have in American history. Obviously it is popularized in American films which have a wide audience here. Gone with the Wind is an iconic film here as it is in America. Other films such as Cold Mountain and Glory were also popular. The novel The Red Badge of Courage has been read by a lot of Australian high school students and is still in the book rooms of many schools. Most Australians are aware of the Japanese attack on Pearl Harbour but many do not know about the Japanese air raids on Darwin and that more bombs were dropped on Darwin than Pearl Harbour. The interest in American history began well before this. In 1908 the U.S. Navy visited Sydney. About half a million people turned out to watch the ‘Great White Fleet’. The level of interest was amazing when you consider there were only 600,000 people in Sydney at the time. World War Two was a watershed moment in Australian history. The Pacific War was the beginning of the alliance between the U.S. and Australia which still exists today. In fact it is the corner stone of our foreign policy. All these factors and more make American history and the history of the American Civil War popular courses at Australian tertiary institutions. DW: Your very brief author bio cites your prior work on WW2 and SE Asia military conflicts. What got you interested in the ACW as a topic and George McClellan in particular? JWG: I have always been interested in American history and in particular the Civil War. The Pacific War and the conflict in Indochina were focused on the American involvement in these two conflicts. Regarding the Civil War, I had always been fascinated by a war that cost more American lives than all their other wars put together. I remember reading about the war when I was a teenager and was amazed that such a war occurred in the first place and only just over a hundred years ago. Recently my interest has been in the strategy deployed by both sides to try to win the war. McClellan became the lens to look at the workings of the Union high command in the first half of the war. I was not interested in McClellan as a battlefield commander, but his influence on Union war aims, strategy, and operations. DW: Being Australian, did it feel like something of an advantage to you not being as relentlessly exposed to the negative baggage that has been attached to George McClellan in the U.S. among scholars and enthusiasts alike? JWG: Not really, because I have read a lot of literature about McClellan, so I was aware of the often intense criticism of him at the operational and tactical level. What I was more interested in was how he intended to win the war. At this level I found he was also deficient. Basically, he believed he alone would win the war with his army. This was contrasted against his organizational brilliance that created a Union army that would help the North win the war. DW: Debating the merits of McClellan is a popular pastime in the Civil War community. Can you briefly describe your purpose in writing this particular book and how it differs from those that came before it? JWG: I did not want to do another McClellan book. I wanted to focus on his influence on the war aims, strategy and operations of the Union. Importantly, I looked at how his legacy of division within the Army of the Potomac’s officer corps destabilized this army for many months. I also did not want to do another “Lincoln’s war” book where the focus was on Lincoln’s contribution to Union victory. I was interested in why it took the Union so long to win the war. I could not accept the idea that the Civil War had to be a long war. So I took the view that there were reasons why the Union could not achieve a victory in a shorter time. This was what I examined in this book. DW: Which authors and their works helped most in shaping your views on McClellan and the Union high command? JWG: There is no direct line from what I have read to my book. My ideas were formed from a diverse range of studies; however, I was interested in Union strategy. Mark Grimsley’s The Hard Hand of War is a brilliant look at the evolution of Union war aims, strategy and its impact on southern civilians. Hattaway and Jones in How the North Won is one of the best books which explains Union and Confederate strategy and operations. It is very good at linking the pre-war training of the Civil War generals on both sides to how they directed campaigns and battles. More recently, Donald Stoker’s The Grand Design is a detailed examination of Union strategy and how it eventually won the war for the Union. Controversially, he argues that the Union could have won the war in 1862 if it had followed McClellan’s plan. I was also interested in “The Revolt of the Generals,” a chapter in Sears's Controversies and Commanders: Dispatches from the Army of the Potomac. This chapter focused on the political intrigue in the Army of the Potomac after the sacking of McClellan. DW: Your book’s subtitle “Leadership Gaps That Cost a Timely Victory” is an intriguing one. Without giving all of them away for free, can you briefly discuss one of the “gaps” from your list and its consequence(s)? JWG: I have identified several leadership gaps in the book. One of these gaps is the Union war aims. Lincoln wanted to restore the Union. He wanted to do this with limited fighting, loss of life and destruction of property. This has been referred to as the “limited war” aims of the Union. This war aim was based on the assumption of strong Unionist sympathy in the south and the belief that the rebellious states would come back into the Union rather than fight a costly war. This was not a realistic war aim and it helped to lengthen the conflict. There was a contradiction in this “limited war” aim because to restore the Union the Confederacy would have to be defeated. This would involve the Union invading the South and the destruction of the Confederacy. This would mean the Union would be fighting to defeat the South and destroy the political structures of the Confederacy. The Union, therefore, could not fight a limited war to defeat the South. DW: You are about as far away from U.S. archives as you can possibly get. How did you manage your research from afar? JWG: Access to primary sources influenced the type of study I undertook. A lot of primary sources are available online, such as access the Official Records. Writing a military history where I looked only at the leaders meant there was a lot of letters, diaries and memoirs available. There were published collections of letters as well. I also have all volumes on the Report on The Conduct of the War. It would have been very hard to integrate any type of social history into the book because access to the letters and diaries of the rank and file of the Army of the Potomac would not have been accessible. DW: Do you have more Civil War projects in mind? JWG: I am interested at examining the Union strategy of raiding into the South with large infantry armies. Sherman’s change of base from Atlanta to the Savannah coast would obviously be a focal point. However, I am more interested in the development of the strategy as a result of the changes to the Union’s war aims rather than a detailed examination of the campaign themselves. By the way, readers, I couldn't pass up the opportunity to ask Prof. Green to recommend a favorite obscure Oxploitation movie, and he proved game with the as yet unseen by me choice of Inn of the Damned. Since 2013, University Press of New England and editor Richard Miller have been publishing their States at War series, which is currently at five volumes. The description to the first volume hints at the breadth involved: "Its principal sources include the Official Records, state adjutant-general reports, legislative journals, state and federal legislation, federal and state executive speeches and proclamations, and the general and special orders issued by the military authorities of both governments. Designed and organized for easy use, this book can be read in two ways: by individual state, with each chapter offering a stand-alone skeletal history of an individual state’s war years, or across states, comparing reactions to the same event or solutions to the same problems." Also, there's a table of contents for it on the publisher's site and a rather extensive Google books preview. The series started in the northeast and trickled down the Atlantic seaboard before dipping its toes into the Midwest. For the upcoming Volume 6, Miller is switching gears to the South with States at War, Volume 6: A Reference Guide for South Carolina and the Confederate States Chronology during the Civil War (January 2018). I've never personally encountered these volumes anywhere. If you've used any of them at length in your research, please add your thoughts on the experience in the comments section. I would be interested in your opinion. by Christina Snyder (Oxford Univ Pr, 2017). Great Crossings is pretty well outside the established topical range of CWBA, but everything that comes in dutifully gets a Booknotes posting. This new study examines the Jacksonian period through the lens of a multi-racial (white, black, and Indian) settlement and school in Kentucky. "These diverse groups met in an experimental community in central Kentucky called Great Crossings, home to the first federal Indian school and a famous interracial family." 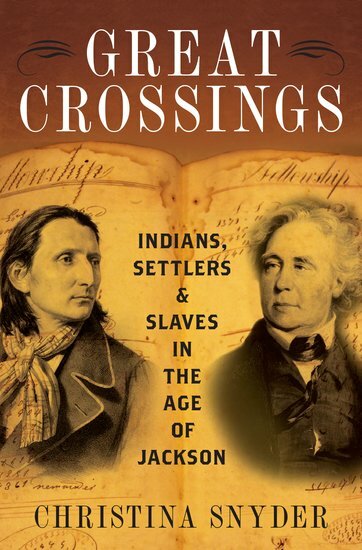 According to the author's view, Great Crossings was symbolic of both the territorial and ethnic/racial/cultural expansion of the United States. "Great Crossings, a place of race-mixing and cultural exchange, emerged as a battleground. Its history provides an intimate view of the ambitions and struggles of Indians, settlers, and slaves who were trying to secure their place in a changing world." by Jonathan W. White (UNC Press, 2017). The high caliber of Jonathan White's early body of work places him among the rising stars of Civil War historians. Another appealing quality is the range and unpredictable nature of his chosen topics. Among other publications, White has authored books on Civil War civil liberties and treason, the 1864 soldier vote, Lincoln's law practice, a soon to be released Monitor study, and now the dreams of Civil War Americans. 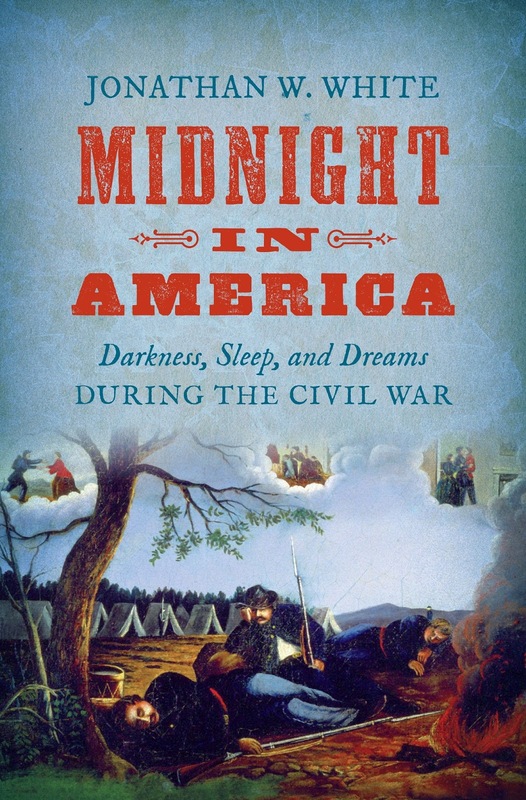 "In this innovative new study, Jonathan W. White explores what dreams meant to Civil War–era Americans and what their dreams reveal about their experiences during the war. He shows how Americans grappled with their fears, desires, and struggles while they slept, and how their dreams helped them make sense of the confusion, despair, and loneliness that engulfed them." More from the description: "White takes readers into the deepest, darkest, and most intimate places of the Civil War, connecting the emotional experiences of soldiers and civilians to the broader history of the conflict, confirming what poets have known for centuries: that there are some truths that are only revealed in the world of darkness." 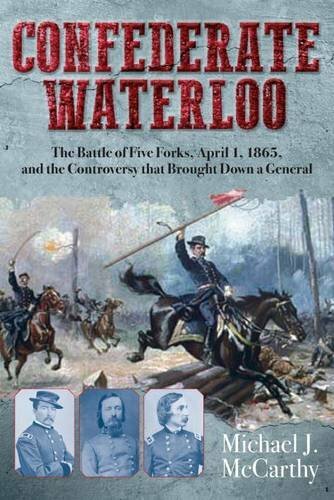 • Confederate Waterloo: The Battle of Five Forks, April 1, 1865, and the Controversy that Brought Down a General by Michael J. McCarthy (Savas Beatie, 2017). The professional disgrace of two well-known Union major generals from the Army of the Potomac still generates a great deal of interest today. The circumstances were different (Fitz John Porter was court-martialed and dismissed from the army while Gouverneur Warren was relieved in the heat of battle), but both men were engaged in long battles to restore their reputations and history has generally judged them to have been wronged. It seems like there have been more Warren-Five Forks studies published than the reality shows. McCarthy's Confederate Waterloo lays claim to being "the first fully researched and unbiased book-length account of this decisive Union victory and the aftermath fought in the courts and at the bar of public opinion." There's also a Warren bio in the works from the same press. A good case could be made that SB has become the preeminent outlet for Gettysburg and Petersburg Campaign military studies. McCarthy's treatment of Five Forks (with its detailed battle history and fine maps) has all the appearances of living up to this reputation. The other half of the book explores the Warren controversy at great length. While Five Forks was an overwhelming Union victory that hastened the end of the war, it "spawned one of the most bitter and divisive controversies in the postwar army when Sheridan relieved Fifth Corps commander Gouverneur K. Warren for perceived failures connected to the battle. The order generated a life-long effort by Warren and his allies to restore his reputation by demonstrating that Sheridan’s action was both unfair and dishonorable. The struggle climaxed with a Court of Inquiry that generated a more extensive record of testimony and exhibits than any other U.S. military judicial case in the 19th Century." The book's discussion of the case "may cause students of the Civil War to reassess their views about some of the Union’s leading generals." 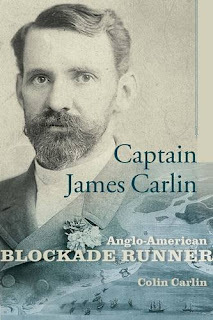 Review of Carlin - "CAPTAIN JAMES CARLIN: Anglo-American Blockade Runner"
Although Confederate officers at the helm of commerce raiders (men like like Raphael Semmes of the Alabama and the Florida's John Newland Maffitt) achieved more lasting fame than blockade runner captains, and the foreign service efforts of James D. Bulloch have tended to overshadow those of other agents abroad in Europe, there were certainly many other highly accomplished nautical men that wore multiple hats while aiding the Confederate cause. Captain James Carlin makes a strong case that its biographical subject's blockade running and naval exploits, as well has fleet management skills, are deserving of greater recognition by Civil War scholars and readers. The father of English-born James Carlin was a Coast Guard station officer, which meant young Carlin would get the fine formal education that the children of Coast Guard members were entitled. In the mid-1850s after Carlin had only recently completed his merchant marine officer apprenticeship, he was invited by an American naval officer of his acquaintance to join the U.S. Coast Survey as a pilot and master's mate. In this capacity, Carlin gained the intimate knowledge of the South Atlantic coastline that would later serve him well as a blockade runner. He resigned from his post in 1860 and entered South Carolina society by marrying into a well-to-do local family. In 1861-62, the capable and always ambitious Carlin sought his fortune in blockade running, piloting and commanding both sailing vessels and steamships. As the book shows, this initial period of Carlin's new career was well representative of early Civil War blockade running, with its rapid transition from vulnerable sail power to the narrow, low-profile, and fast steamers that would come to dominate the illicit wartime trade in the South Atlantic and Caribbean. The diplomatic dimensions of the Union blockade of the southern coast have been abundantly explored in the wider literature, but the book's meticulously detailed account of Carlin's involvement in an extended diplomatic imbroglio between the U.S. and Great Britain offers some interesting insights not found elsewhere. Captured as a passenger on the Memphis in August 1862 as the steamship was exiting Charleston, Carlin was quickly identified by Union authorities as a person of interest and imprisoned in Fort Lafayette. Source material located in archives on both sides of the Atlantic were effectively used by the author to reconstruct the story of Carlin's incarceration, as well as the protracted diplomatic wrangling (which reached the highest levels of both governments) that finally resulted in Carlin's release after five months of close confinement. Much of the contention revolved around Carlin's citizenship status. Given Carlin's employment with the U.S. Coastal Survey and his long residence in the country, the U.S. State Department and Navy operated under the assumption (without any supporting documentation) that Carlin was a U.S. citizen, while the British government possessed proof of foreign citizenship and demanded that Carlin be released like the other Memphis passengers. The author's view that Secretary of State Seward and Navy Secretary Welles deliberately drew out the proceedings to keep Carlin, whose specialized experience and knowledge made him invaluable to the enemy, imprisoned as long as possible before inevitable release is persuasive. The case study of Carlin's pressured release (even though U.S. authorities clearly recognized the great likelihood that he would return to South Carolina and resume his former activities) is further testament to the global power of British diplomacy of the period. Carlin indeed returned to blockade running between Charleston and the Bahamas during the first half of 1863. By the end of that time, he was senior captain (informal "commodore") of the Import and Export (I&E) Company of South Carolina. Embittered by his long imprisonment, Carlin also sought out opportunities for more direct action against Union ships, and the book details Carlin's role in outfitting and captaining the spar torpedo boat CSS Torch. The study's full account of the Torch's failed attack on the formidable USS New Ironsides is informative. Though the Torch incident has been largely forgotten in favor of a later attack by the CSS David, which succeeded in damaging New Ironsides, the book plausibly credits the activities of the Torch in forcing the U.S. Navy to position its ships farther from shore. In late 1863, Carlin was sent to England by his employers to procure new ships to augment the blockade running fleet and replace worn out vessels. He successfully completed this mission, overcoming numerous obstacles along the way. With the tide of war shifting decisively in the Union's favor, Carlin resettled his family in Liverpool in 1864 and skillfully managed the company's fleet from there. A man of action to the end, he was an onboard presence on many late-war trips between Charleston (where he maintained properties) and Nassau. His last runs before the close of hostilities were into Galveston. After the war, Carlin rejoined his family in Liverpool, where he discreetly disposed of the fleet. However, he still sought out New World business opportunities in Florida, South Carolina, and in the Caribbean. In 1869, he ran arms and revolutionaries into Cuba. On return to the Bahamas, his ship was seized, and he was determined to be in violation of his country's Foreign Enlistment Act, which was being much more strictly enforced after the legal headaches stemming from U.S. claims against British-built commerce raiders. Carlin eventually escaped these troubles and kept a lower profile for the rest of his life, eventually passing away at a rest home (or asylum) in 1891. Though the project began with author Colin Carlin's interest in family history, the text is refreshingly free of tones of ancestor worship or exaggerated achievement. Carlin also takes a suitably skeptical view of family lore not based on actual evidence. Rather extensive continuity interruptions exist in the known life of James Carlin, and the author does a noteworthy job of using a variety of archival records located in Ireland, the United Kingdom, and the U.S. in order to address, either directly or by way of inference, many of these biographical gaps. On occasion, Carlin's grasp of peripheral history can be a bit unsteady (e.g. in the book, you'll find "Arthur Sidney Johnson" for Albert Sidney Johnston and CSS "Huntley" for the famous submarine Hunley) but this concern doesn't appear to carry over to matters more directly at hand. Captain James Carlin lifts out of relative obscurity an important Civil War nautical figure. In addition to richly documenting Carlin's often shadowy life, the study contributes significantly to our wider knowledge of the war's blockade, naval, and diplomatic histories. Back in May of last year, I mentioned the freely downloadable digital atlas of the 1864 Missouri Expedition that was published by the press of the U.S. Army's Combat Studies Institute. 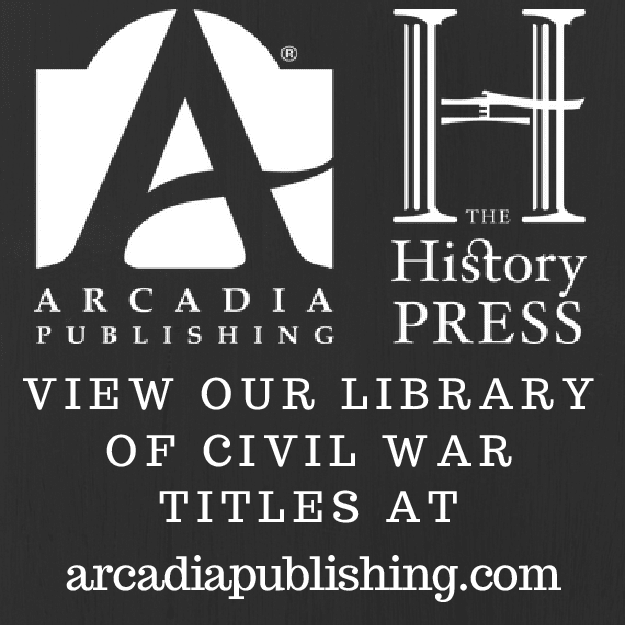 A print version Battlefield Atlas of Price's Missouri Expedition of 1864: Road to Saint Louis, Battle of Lexington, Mine Creek, Marmaduke's Raids, General Samuel Curtis, Sterling Price just became available. • McClellan and the Union High Command, 1861-1863: Leadership Gaps That Cost a Timely Victory by Jeffrey W. Green (McFarland, 2017). Green's book examines the Union high command during the first half of the war through the lens of McClellan, who was the dominant military figure of that period (at least in the eastern theater). "This re-examination of the high command and McClellan's war in the East provides a broader understanding of the Union's inability to achieve victory in the first two years, and takes the debate about the Union's leadership into new areas." An interview with the author is forthcoming and will serve as a better introduction to the volume than a Booknotes post, so I'll cut this short. I have my fingers crossed that I'll get the answers back in time to post the Q&A this week. National Tribune articles are a key part of modern Civil War research. "The National Tribune was the premier Union veterans’ newspaper of the post-Civil War era. Launched in 1877 by a New York veteran to help his comrades and sway Congress to pass better pension laws, a short time later the National Tribune began publishing firsthand accounts penned by the veterans themselves, and did so for decades thereafter." SB typically concentrates on more commercial fare, but they have published reference works in the past. Here, they've teamed up with Richard Sauers to put out The National Tribune Civil War Index in three volumes currently scheduled for a late 2017 release. More from the description: "The first two volumes are organized by author, his unit, title, and page/column location. The third volume―the main index―includes a subject, author, and unit guide, as well as a “Unit as Sources” index that lists articles that mention specific commands but are written by soldiers who were not members of that unit. As an added bonus, this reference guide includes the contents of both the National Tribune Scrapbook and the National Tribune Repository, two short-lived publications that included articles by veterans, and a listing of the major libraries that have National Tribune holdings." Undoubtedly, research libraries of all kinds will want a copy of this set for their reference sections. Booknotes: The Civil War Diary of Rev. James Sheeran, C.Ss.R. • The Civil War Diary of Rev. James Sheeran, C.Ss.R. 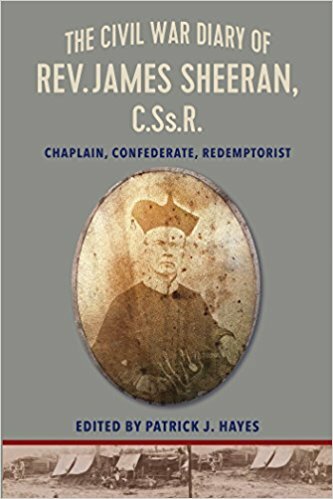 : Confederate Chaplain and Redemptorist edited by Patrick J. Hayes (The Catholic Univ of America Pr, 2016). A native of Ireland, Rev. Sheeran was the chaplain of the 14th Louisiana during the Civil War. He "was one of only a few dozen Catholic chaplains commissioned for the Confederacy and one of only two who kept a journal." Sheeran's voluminous 1862-65 diary is "arguably the most unique narrative of the war written by a chaplain of any denomination and certainly is the most extensive." The diary has long been used as source material for Army of Northern Virginia studies, and Gary Gallagher's cover blurb describes the new edition as "by far the fullest and most accurate to date." More from the book description: "The window given into the pastoral dimension of serving in America's bloodiest war is further enhanced by a running commentary on politics, race, religion, and charitable works throughout the South. He also supplies an insight into incarceration as a prisoner of war at Fort McHenry, Baltimore. Last, because Sheeran was a frequent name dropper, tracking the movements of key military personnel or other personages of the war is made considerably easier through Sheeran's references―all of which have been scrupulously documented in an easy-to-use index." Having had a Catholic upbringing, I probably shouldn't have needed to look up which order was C.Ss.R and had members called Redemptorists. Since Sheeran was apparently a diehard Confederate, my first thought was that the publisher had come up with another word for Redeemer/Redemptionist. In terms of Atlanta Campaign battle books, it continues to amaze me how quickly we've gone from decades of next to nothing to, after only a few short years, the existence of competing (for lack of a better term) major works. Full length studies of Ezra Church from Gary Ecelbarger and Earl Hess were published only a year apart, and now Hess is applying his own inimitable touch to another major Atlanta battle. I had more than a few problems with the clunkiness and poor presentation of Robert Jenkins's 2014 study of Peach Tree Creek [see the review] but still appreciated its great strengths and found it more than worthy of recommendation. This coming September, Hess's The Battle of Peach Tree Creek: Hood's First Effort to Save Atlanta will be published by UNC Press. From the description: "Offering new and definitive interpretations of the battle's place within the Atlanta campaign, Earl J. Hess describes how several Confederate regiments and brigades made a pretense of advancing but then stopped partway to the objective and took cover for the rest of the afternoon on July 20. Hess shows that morale played an unusually important role in determining the outcome at Peach Tree Creek—a soured mood among the Confederates and overwhelming confidence among the Federals spelled disaster for one side and victory for the other." The proper spelling of the battle — 'Peach Tree Creek' over the more traditional 'Peachtree Creek' — is one obvious point of agreement between the two authors. • American Civil Wars: The United States, Latin America, Europe, and the Crisis of the 1860s edited by Don H. Doyle (UNC Press, 2017). This is a good idea for a book. 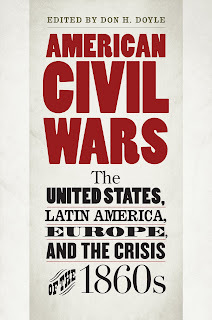 The international dimensions of the Civil War era beyond just North America and Europe are getting much more attention these days, and editor Don Doyle has collected quite an international cast of topics and historians for his essay anthology titled American Civil Wars. From the description: "Contributors position the American conflict squarely in the context of a wider transnational crisis across the Atlantic world, marked by a multitude of civil wars, European invasions and occupations, revolutionary independence movements, and slave uprisings—all taking place in the tumultuous decade of the 1860s. The multiple conflicts described in these essays illustrate how the United States' sectional strife was caught up in a larger, complex struggle in which nations and empires on both sides of the Atlantic vied for the control of the future." Domestic essays look at growing U.S. global power, the crisis over possible foreign intervention during the Civil War, and Confederate designs on Latin America. Others examine themes related to the British, French, and Spanish empires, as well as Dominican reannexation, Mexico's own civil conflict, Cuba, politics in Spanish America, and slavery in Brazil. "This volume breaks new ground by charting a hemispheric upheaval and expanding Civil War scholarship into the realms of transnational and imperial history." 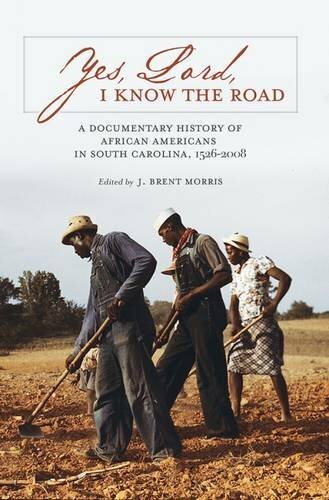 • Yes, Lord, I Know the Road: A Documentary History of African Americans in South Carolina, 1526-2008 edited by J. Brent Morris (Univ of S Carolina Pr, 2017). "Yes, Lord, I Know the Road is the first comprehensive history of African Americans in the Palmetto State." Its collected documents span the "first North American slave rebellion near the mouth of the Pee Dee River in the early sixteenth century" through Barack Obama's 2008 victory in the state's Democratic primary. Editor J. Brent Morris contributes a general introduction and his selections assembled together "a wide variety of annotated primary-source documents―personal narratives, government reports, statutes, newspaper articles, and speeches―to highlight the significant people, events, social and political movements, and ideas that have shaped black life in South Carolina and beyond." Many of the documents are published here for the first time, and many others have been previously published but difficult to find. The resources are presented in the typical manner of documentary histories, with the material organized by theme and with brief introductory comments for each item. Notes and an index are in the back. edited by James M. Scythes (Lehigh Univ Pr, 2016). At seventeen years of age, infantry Second Lieutenant Thomas James Howell of the 3rd New Jersey was an uncommonly young Civil War officer. Unfortunately, like many of his comrades, Howell's life was a tragically brief one, coming to a grisly end during the Battle of Gaines's Mill. 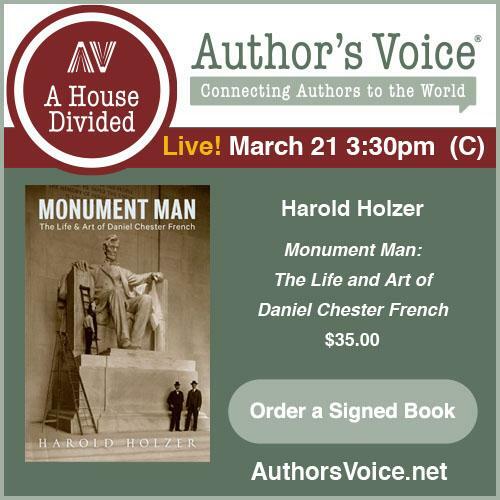 "Featuring sixty-five letters that Howell wrote home to his family, this book describes soldier life in the Army of the Potomac during the spring and summer of 1862, focusing on Howell’s experiences during Major General George B. McClellan’s Peninsula Campaign." The material is extensively annotated by editor James Scythes, who also contributes a substantial general introduction, as well as lengthy introductory narratives to Parts I and II of the book and a concluding essay. Numerous maps and photographs are also included. Beyond the novelty of the subject's extreme youth, it looks like the material might also (as already mentioned above) prove quite useful to Peninsula Campaign students. Review of Thompson - "TEJANO TIGER: Jose de los Santos Benavides and the Texas-Mexico Borderlands, 1823-1891"
Life in the Texas borderland sandwiched between the Nueces and Rio Grande rivers often proved precarious during the nineteenth century. Tensions between rival local, state, and national governments were rife, and Indian raids and cross border banditry frequent and widespread. Laredo native Santos Benavides (1823-1891) was both witness and key participant to this decades-long period of domestic strife, open warfare, and transformative social and political change. 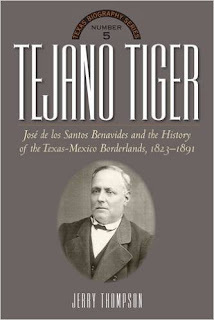 Career Southwest history specialist Jerry Thompson's Tejano Tiger: Jose de los Santos Benavides and the Texas-Mexico Borderlands, 1823-1891 gives this important figure his proper historical due and is the first full biography of Benavides to appear in the scholarly literature. Born into a prominent Laredo Tejano family in 1823, Santos Benavides greatly benefited, according to Thompson, from his uncle Basilio's guiding hand and long experience in local and state politics under three republics. In the period preceding the Civil War, Santos would become a very successful rancher and businessman, as well as a popular local political leader (among other posts, he would be elected mayor of Laredo in 1856). He also gained valuable para-military experience fighting bandits operating out of Mexico and, from the opposite direction, raiding bands of Comanche and Lipan Apache. Santos was commissioned a captain of Texas volunteers in 1861, and he would eventually reach the rank of colonel (the highest ranking Tejano in the army of the CSA) even though he never led more than a few companies at a time. His entire Civil War service was spent along the Rio Grande front, a post which required both military and diplomatic skills. It is Thompson's view that Benavides excelled in both arenas. Through great affection for Mexico but loyalty to Texas, Benavides was able to promote friendly relations (for the most part) on both sides of the border. He also demonstrated his military skills on two great occasions. In 1861, he crushed invading forces led by Mexican marauder and would-be revolutionary Juan Cortina and in 1864 defeated advancing Union forces at the gates of Laredo. However, as the book shows, pitched battles were few and far between, and Benavides's most significant contribution to the Confederate cause was in consistently keeping open a vital stretch of the Rio Grande for the all-important cotton trade with Mexico, the proceeds of which kept the isolated Trans-Mississippi Department afloat. This task became even more important when Union forces seized the mouth of the Rio Grande in 1863, and advanced inland. The victory at Laredo mentioned above was a critical event in keeping Union forces based on the coast from linking up with their brethren in southern New Mexico and choking off border trade entirely. Thompson also explores at some length the unproductive feud between Benavides and his immediate superior, Colonel John S. "Rip" Ford. Ford was frequently frustrated with Benavides's insubordination, and Ford, in turn, was blamed by Santos for preventing the rank-ambitious Tejano from obtaining a much sought after brigadier general's star. Even though the two never reconciled, Ford (unlike Benavides) was able to look past personal animosities, and the famous Texan generously praised the Civil War contributions of Santos in his memoirs. Really, the Civil War section of the book is far richer than expected. Those chapters together comprise perhaps the literature's very best account of the Civil War along the Texas-Mexico border between Eagle Pass and Rio Grande City. Benavides generally supported conservative Democrats and later aligned himself with their stances on social issues when he served in the state legislature after the Civil War. Some of his closest friends and allies, like Edmund J. Davis, declared themselves for the Union in 1860-61, but it appears that Santos himself had no reservations about joining the Confederate cause. In addition to having social views compatible with the Texas majority, perhaps he viewed his wealth as being best protected and served by remaining loyal to the Lone Star State. Thompson also very plausibly suggests ideological transference between Santos and Uncle Basilio's long standing opposition to strong central control from Mexico City and the States' Rights debates of their new country post-annexation. Given how deeply intertwined the long life of Santos Benavides was with his beloved hometown of Laredo, the book also serves as an excellent social, economic, and political history of the town itself. One of the study's most striking features was its in-depth discussion of party machine politics in Laredo, which proved just as cutthroat as those found in the great cities of the North and culminated in the shockingly bloody election riot of 1886. Thompson also details how Santos and other local leaders during the post-Civil War period built between Laredo and Nuevo Laredo a literal and figurative bridge between Texas and Mexico. Benavides was influential in bringing the railroad to Laredo from the Texas interior, as well. At the same time, he used his deep personal connections south of the border to assuage the security concerns of Mexican officials, who feared that railroad links in the northern Mexican states might entice another invasion from the United States. The effort was a success, and Benavides helped modernize trade and communications between both countries. As he did both before and during the Civil War, Benavides consistently sought closer ties between Texas and Mexico during his three terms as a state legislator in Austin. The Civil War ruined many others, but Benavides was fortunate enough to have retained his considerable wealth and (as mentioned above) was often sought out as a facilitator of border business interests. According to Thompson, Benavides's extremely poor command of the English language (which he apparently made little effort to improve throughout his life) was a significant limiting factor to political advancement. Perhaps his greatest political disappointment was in fellow Democrat Grover Cleveland's dismissive rejection of Benavides as candidate for U.S. Ambassador to Mexico. In researching this book, Thompson mined an impressive array of archives and newspapers from both sides of the border. Complaints are few, and none are serious. Cosmetic errors pop up here and there, and, at one point, a photo caption inaccurately claims that John B. Magruder lost an arm in Mexico. Tejano Tiger convincingly positions Jose de los Santos Benavides as one of South Texas's most important social, political, and military figures of the nineteenth century. In addition to providing an exhaustive record of the Civil War military career of Santos Benavides, Thompson's book also recounts the full life of a man whose unusually steadfast commitment to binational harmony and prosperity deserves to be more widely remembered. 1. Pea Ridge: Civil War Campaign in the West by William L. Shea and Earl J. Hess (1992). The 1990s comprised a golden decade for authors, publishers, and readers. Entire aisles at mega bookstores like Barnes & Noble and Borders were crammed with Civil War titles of all kinds (the contrast to B&N today is rather disheartening given that the actual richness of the literature is not at all diminished). One of the best titles released during this era was Shea and Hess's Pea Ridge, a treatment of the campaign that's unrivaled in every way to this day and perhaps may never be superseded. 2. The Battle of Pea Ridge: The Civil War Fight for the Ozarks by James R. Knight (2012). If detailed, full-length battle studies aren't your thing, then Knight's popular overview (which, if I recall correctly from the notes, heavily references Shea & Hess) will more than suffice. 3. Wilson's Creek, Pea Ridge, and Prairie Grove: A Battlefield Guide, with a Section on Wire Road by Hess, Hatcher, Piston, and Shea (2006). Part of Nebraska's This Hallowed Ground series, this volume is the best guide for touring the Pea Ridge battlefield. Including the critical Ozarks thoroughfare of the Wire Road in the book was an inspired choice. 4. "The Battle Raged... With Terrible Fury:" Battlefield Archaeology of Pea Ridge National Military Park by Carl Carlson-Drexler, Douglas Scott, and Harold Roeker (2008). This highly readable government report is an archaeological study of the battlefield that arrives at some interesting conclusions. You can download the digital version for free from here. by Robert G. Schultz (2014). The resounding victory at Pea Ridge left Union military authorities in NW Arkansas in a quandary over how to properly exploit it. While its narrative is choppy and maps poor, Schultz's book is the first and only full-length account of General Curtis's long march west to east across the state and his occupation of Helena after the aborted advance on Little Rock.